This thread is for comments about our Feral Druid guide. Hey there. 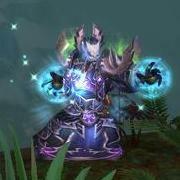 I have reviewed your current Feral guide for MoP and you have a lot of great information in there. Based on my experience and testing in the beta I have a few suggestions you may want to have a look at. This is actually incorrect. For Feral renewal is actually the weakest for 3 reasons. Renewal does not make use of the Catform Glyph. The other two do. The cooldown is too long to be of any use in leveling, and too long to be used regularly for encounter mechanics. It’s only a panic button. Dream of Cenarius is the current DPS winner. It looks like you have an old version of DoC posted so the conclusion drawn here may have been correct before the DoC change. Only Major Glyphs play a part in your performance as a Feral Druid. You left off the list a required Feral Glyph, Catform. The talent Nurturing Instincts healing portion has been added to this glyph. With our built in self-healing and with our overall squishyness it is really silly not to take 20% more healing taken. This is a required glyph for all situations as Feral. I would not recommend Glyph of Shred for raiding. This glyph is amazing for leveling, and for PVP. However for Raiding it is a poor choice and encourages poor play. If you are not behind your target in a raid (save stupid encounters like Ultrax/Kolagarn/Rag) you are doing it wrong. It is understandable if bosses do quick turns for casts which isn’t your fault. The worst you get is a message that you need to be behind your target. No GCD is triggered and no energy is lost. However if you use the glyph and sit in front of the boss you can get parried. This will lose you 12 energy (6 in Berserk) and will trigger a GCD. With this glyph at best your DPS will be the same as if you were behind the boss the whole time. At worse it’s a DPS loss. Do not use this glyph outside of Leveling and PVP. I wouldn’t recommend doing this for an opener. Unless they fix it so you can use Savage Roar while stealthed (currently it takes you out of stealth) you will not have time to get SR up go stealth and get to the boss in time to get Rip going before SR needs to be refreshed. I know this is the simple section describing the rotation, but it looks like you are putting Rip on a higher priority than Savage Roar. Because of bleeds being a snap shot of current stats you have to have SR be the #1 priority over every ability. I believe that is emphasized in the in depth section, I just don’t want to see folks confused. In a cleave situation what you suggest is only possible with a Warlock as your Symbiosis target. The ability to move your bleeds to the second target will not shift your combo points to the new target. Right now even with Soul of the Forest crit and energy regen do not allow for this very often. You will need a lucky crit string and OOC procs. For AOE again SR must be up first or the Thrash bleed will be hitting for 30% less damage. Unless you expect AOE to last at least 30 seconds sustained it is a waste of combo points to try and get Rip on any target. The target will likely die long before Rip has had a chance to finish. The bold section is a typo, but may confuse people into thinking they get 120 energy out of using TF. You list 2 spells which look good on paper but if you attempted to actually use them it would become instantly clear they are useless. The bolded part is incorrect. Death Coil costs 40 energy to use. On top of that the damage is VERY lackluster. It hits for about 15k on a raid boss. It does not generate combo points, and the damage is not modified by DoC, or TF. The healing component is useless to the alliance unless a DK pops the Tier 2 talent to make them undead for a short time. Not a worthwhile trade unless you are forced to put it on the DK tank for the cooldown. In any case never use Death Coil. Again while it looks like a nifty cooldown, they to a total of around 30k damage over those 30 seconds. Also they are bugged and will not attack your target for the first 5 seconds after they are summoned. It makes for about a 250 dps boost at best if used on cooldown. You should try to refresh Rip when there are 2 or fewer seconds remaining on the current Rip. When the existing Rip is stronger than the Rip you are trying to apply (for example, it had been cast while under the effects of Tiger's Fury), you will get an error message and you will not be allowed to refresh it. In this case, simply wait until it expires fully before reapplying it. The error message will only come up for a Rip that was cast when your AP was higher than it is now. You are able to overwrite a Tiger’s Fury Rip with even a lower combo point Rip. Thank you very, very much for your excellent comments. I've updated the descriptions for Tier 2 and 6 talents. I've added Glyph of Cat Form. I didn't remove Glyph of Shred because, while it might encourage poor play sometimes, it can still have a benefit in exceptional situations. I've fixed the order of the rotation (I do believe that the one I had written was still correct, but as you said, this way it is clearer to understand). Regarding starting with Ravage in Stealth, it should be pretty easy to do if you set up a 12-second Savage Roar on yourself right before the pull, should it not? I've fixed the AoE rotations, as you suggested. I've removed Death Coil from symbiosis, and added a mention that Feral Spirit is weak. Finally, I fixed the two issues you mentioned regarding Tiger's Fury. Thank you again for helping me make the guide better, and I'm looking forward to any other comments you make! In the glyphs section, you should reword the Shred glyph to say while Tigery's Fury or Berserk is active. Currently it reads and, which both buffs do not have to be active for the glyph to work. Currently your tooltip for Dream of Cenarius and the description below are not consistent. The tooltip reads that the increase to the next 2 melee attacks is 25%. Your description below reads "Healing Touch increases the damage done by your next 2 melee abilities by 65%." Other than that, nicely written. He is correct though. As a Feral the only non instant heal we can cast to proc DoC is Healing Touch. While the Tooltip is for all Druids, this guide is specific to Ferals, so we will always use Healing Touch here. The timing on this would be really tricky. You will need a precise countdown by your RL, to hit SR (starts a GCD), then hit Stealth, Wild Charge to the target and hit Ravage. This gives you about 9 seconds to get Rip going. In full 483 gear, gemmed and enchanted on the beta gives us about 32% crit. With Ravages built in 50% bonus above 80% that gives you aboute an 83% chance to crit and 45 energy spent. You have to get Rake up next (35 energy) and Shred to 5 combo points (40 energy each). If you are lucky with Ravage and at least other other attack you have 5 combo points 5-6 seconds left on SR, and 10 energy ((45+35+40)-30 energy regen). Now TF/Berserk macro to hit Rip. You now have about 1-2 seconds of SR left. This is the best case you can hope for. If you don't get 2 crits on those opening 3 attacks its not likely you will have the time to get Rip up before the first SR runs out. If you are trying to use DoC, you will precast HT before SR on the pull, and will use Natures Swiftness on the first Rip. This loses another GCD to make sure Rip is buffed, which is already tight as it is. Getting an OOC proc, or lucky on the crits could make this opening turn out ok. But you have a much higher chance of having to spend your combo points to refresh SR and end up delaying your first Rip by several seconds. As we get more gear its likely this could work out much more consistantly. Thanks so much for all the feedback you've provided. It's appreciated. Oh my bad for misunderstanding. Thanks for a nice guide, and also nice to see veteran feral theorycrafters around here. Cheers to you! Feline Swiftness doesn't stack with the Cat form speed boost now, so taking it is pretty much a wasted talent point for ferals. I disagree entirely with your choice of soul of the forest for tier 4 talent. Please correct me if wrong, but it is the weakest of the talents. You can view it as getting four energy off every combo generator skill, which sounds really great on paper, but over the course of time it does not yield efficient damage. It can also be viewed as getting one free shred for every two full combos you do. That sounds a little less impressive. I realize I don't have deep data pools, but I did a quick run on a target dummy just to have some numbers and hit 22 combo generators in a regular rotation using tiger's fury, but not berserk, over the course of one minute. That's 88 energy, or just over enough for two free shreds, which were hitting for 12k on a normal hit, add about 50% for crit chance and we made 36k damage and two free combo point. The trees hit for 55k alone. I did a run with berserk, incarnation, and lifeblood macro'd together with a tiger's fury after berserk on a clean dummy, applying farie fire and tiger's fury before starting, then repeated this without incarnation (both runs 30sec). The difference was 147,890k (and I even bobbled stuff durring the incarnation run because of ravage being on an annoying keybind, and also it was done on a target dummy that displays half health after being hit atop hall of the brave in VoH so the ravage boost over 80% does not apply to my numbers), which beats the necessary 108 to be better than soul of the forest (36k times 3 to extend the data to the 3 min cd of incarnation). While the implimentation of berserk will increase the benefits of soul of the forest, and it is a talent that becomes more appealing the more haste you stack, you also must consider when raiding you tend to use berserk at key points (when a boss is more vulnerable to damage than usual or when something comes up that needs to be burned then such as the dark phase of zon'oz or the tendons in spine) and ravage's crit above 80% not factored in thus giving it too a damage boost also. If anyone can provide numbers showing me why soul of the forest is valued, please share them because the only thing I can see going for it is pasiveness/laziness. Also, I see it was discussed before, but I'd like to bring up the tier two heal talents again. This was one of the first things I tested (and I'm going off memory here), but renewal hit for around 40k. Not terribly impressive with a 2 min cd, and as was mentioned earlier it is the weakest of them all (can't crit, doesn't benefit from cat form glyph, and is weaker than natures swiftness with twice the cd). Cenarion ward is a good chunk of heal at 33k, but it's mechanics can make it unwieldy. It has to be proc'd by damage and it takes two seconds after that damage for the first tick to take effect. This isn't terribly useful if used for a dungeoning/raiding spec because the healer is likely to top you off by the time much of anything takes effect. Nature's swiftness is the real winner here. If you want you can even macro it in to cast healing touch at the same time since it isn't on the gcd (and I'll post that at the bottom here). NS hits for around 60k, which is not only more than renewal, but half the cd. There is _NO_ reason whatsoever for a feral to choose renewal in my opinion. It also has added utility (word I kept looking for and never found in my previous post in reference to incarnation) for being able to cast a 1.5x durration cyclone (does not work against players though, which kinda miffs me). There's nothing like landing a crit on NS and healing 120k+. It's like having LoH at that point. A correction to my comment about soul of the forest, I did make an error in my calculations. Because of the way I calculated it (counting the number of combo generators over a minute) I failed to incorporate the chance for getting two combo points on crit. Again assuming 50% crit rate for ferals for simplicity, that would be 33 combo points, 3 free ravages, and an average 4.5 combo points generated does make it very competetive. An additional note to the healing talents post, cenarion ward is the only one of them which costs mana. While this is in no way a problem in pve, in pvp there will be times that require healing and cc'ing outside of predatory swiftness and the additional mana use can be taxing. I do feel inclined to ask, was there any testing done to establish all secondary stats are still equal for ferals, or was it just taken as a given and the same as before? I can't see it being true given some of the changes. We (and all else) have lost our bleed increasing debuff from mangle, which really seems to hurt our rip (makes mastery less efficient?) where as the changes to savage roar now affecting all physical damage seems that it would bolster the usefulness of crit and haste. The sheer fact that base melee has been topping my charts now, which had always been topped by rip and shred, leads me to believe haste has to be more effective than it previously was. I don't feel I have the capacity to test such things myself. Sorry. It's been a while since I posted here, but I keep a constant eye on this (and every other thread). I've re-worded things to emphasise the power of Nature's Swiftness relative to Renewal. I've also added a Nature's Swiftness + Healing Touch macro. Regarding the things you posted about, Namiel: I've researched the issue and it seems that Soul of the Forest is ranking slightly above Force of Nature. Not by much, though. http://fluiddruid.net/forum/viewtopic.php?p=8231#p8231 that is the most relevant and reliable post I was able to find. If things change or new information comes to light, I will update the guide accordingly. "Ideally, you should have relatively low Energy before using Berserk, so that you do not end up capping your Energy." I think this is wrong, because if you do use Berserk with close to 0 energy you will eventually run out of energy when spamming abilities on every GCD, and you have to wait for a split second to get enough energy for Shred etc. You dont want this because the more abilities you are able to squeeze in during the Berserk, the more energy you save as they have a lower energy cost. Even if you Berserk at 90+ energy you will run out of energy before the end of the Berserk*, but as you pooled energy before the Berserk it was used with maximum efficiency. You will still not waste energy from being energy capped when using Berserk with 90+ energy unless you do something like a finisher with the Soul of the Forest talent just after activating it. * This is especially true if you use Ferocious Bite during the Berserk, in WotLK it was a DPS loss to do this, but I dont know about MoP so dont quote me on this one, but it feels better to just spam away your other abilities in proper order instead of using FB. The secondary stats change depending on the talents you choose. DoC favors a mastery heavy build for example. Feline Swiftness does stack with catform. Without the talent runspeed is 125%, but with the talent its 144%. Tier one displacer beast is listed as having no concievable uses out of being situational, I feel it's more appropriate to list it as a primarily pvp ability. It's useful for breaking combat to refresh potion usage, evading enemies to heal up/escape death, or to get stealth abilities like pounce out while in combat. The only problem with it, in my mind, is that it doesn't remove dots and almost everyone has a dot they're gonna keep up on you, so it'll be really difficult to fade out sucessfully as it is. Without that, I still feel that wild charge makes a better pvp feral choice, but displacer beast is a viable alternative. Your points regarding the PvP utility of Displacer Beast are good. The guide in question is, however, a PvE guide, so going into such details about the usefulness of the ability in PvP is beyond its scope. When we write PvP class guides (and we will, soon enough), this is something that will fit in well there. From what I can tell, this guide seems to be the most accurate in terms of the current patch. Great work on everything! With the most recent update you did, I noticed that Nature's Swiftness was said to provide more healing with current health pools (which I've found to be true doing my own testing). Upon trying the macro, I found that casting it takes you out of cat form and puts you in caster form before casting Healing Touch. While this is not a huge deal, I found it much more beneficial (i.e. less buttons to click and less time not doing damage) to use a cast sequence macro instead. after the first Healing Touch, it tries to cast Healing Touch again. Since you don't have Nature's Swiftness up for the second Healing Touch, it automatically shifts you out of Cat Form. The only time that this isn't is when you are moving. I'll update the guide to reflect this. Of course I meant that it's the best guide for this patch! You guys were also the quickest to update, which I very much appreciate!